The Comfrey above is very happy in its shady, well watered location. This Comfrey is planted in 5 gallon buckets and sits beneath both an oak tree and 50 percent shade cloth. It can take more sun and in more northern states should be in more sun, but it needs plenty of moisture. We can't plant it directly into the ground here because gopher's like to eat it. The large hairy leaves of Comfrey stay close to the ground throughout most of the year. As fall approaches, slender stalks of leaves emerge. These leaves get gradually smaller as they near the top, ending in gracefully hanging, tiny bell shaped flowers. Russian Comfrey is sterile which means it does not make viable seed. Often thought of as invasive, the plant really doesn't present a problem until the root is disturbed. Once cut, the root pieces make new plants and this can lead to Comfrey overload in the garden. Comfrey has been used for thousands of years as a medicinal herb. 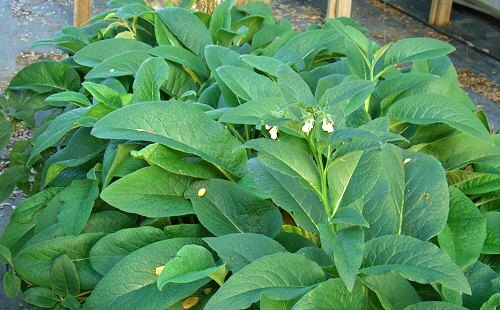 In 2001 the FDA issued a warning about the ingestion of comfrey and since that time it has been recommended not to take it internally. It does still have applications as an external poultice. For more on this use, visit the National Institute of Health. Interestingly, as Comfrey came under fire for internal medicinal use, we found other reasons to keep it around. Besides being attractive, its leaves add relatively high amounts of nitrogen, potassium and phosphorus to the compost pile. Or, use the leaves as a direct mulch and let them break down right under the plants. Once the plant has some size on it, you can cut leaves and use them whenever there are enough to mess with. Late fall pruning should be avoided as the plant starts to flower and go into its readiness phase for winter dormancy. As the last batch of leaves rot, they fertilize the plant for better growth next spring.